The Lazaridis Institute's Josephine McMurray and Karin Scharr were on hand at the 2017 Organizational Development and Change Division's Annual Meeting at the Academy of Management in Atlanta. 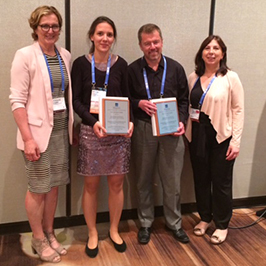 On behalf of the Lazaridis Institute, Josephine was thrilled to present the Best Division Paper Award to Simone Gutzan and Harald Tuckermann. Their winning conference paper is entitled: Collective reflection as an orchestrated organizational effort. Ms Gutzan is a doctoral student at the University of St. Gallen, Switzerland. Dr Tuckermann is Assistant Professor at St. Gallen. Both work at the Institute for Systemic Management and Public Governance. Congratulations to Simone and Harald!